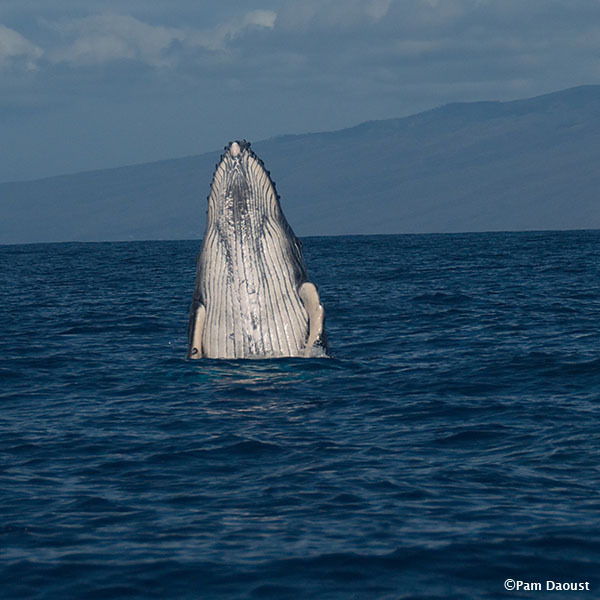 February is peak season for humpback whale sightings in Maui waters. The whales (Megaptera novaeangliae) are here in full force, newborn calves are plentiful, and romance is in the air—or rather, in the surrounding ocean where propagating the next generation is a top priority. 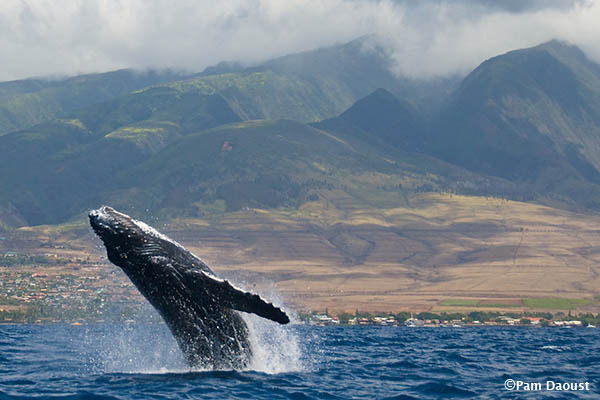 Tourists often stop their cars to watch a kohola (Hawaiian word for whale) breaching or blowing. Locals may barely notice. But for all those who still feel a breathtaking thrill whenever forty-five tons of magnificent cetacean suddenly erupts from the ocean to reach fantastic heights, and then lands with a splash that can be seen and heard for miles, here is a guide to typical humpback whale behaviors. 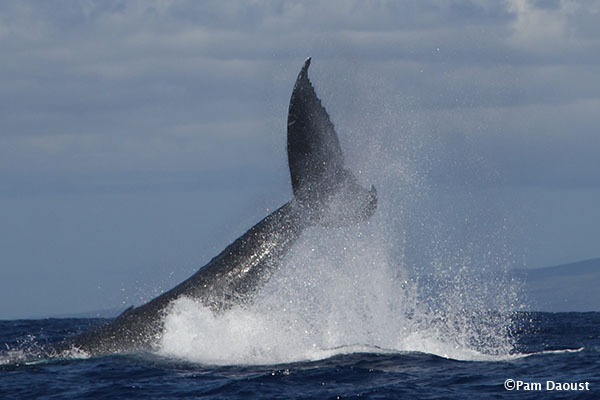 “Breaching” occurs when a whale uses one of the most powerful muscles in the animal kingdom to propel itself partially or fully out of the water. The peduncle muscle, located between the dorsal fin and the flukes (the two halves of a whale’s tail), allows for this acrobatic maneuver. A midair twirl is often included. Breaching may be intended to shake off barnacles, announce the animal’s presence, or communicate information that scientists are still trying to decipher. Whatever the reason, the spectacle is eye-catching. 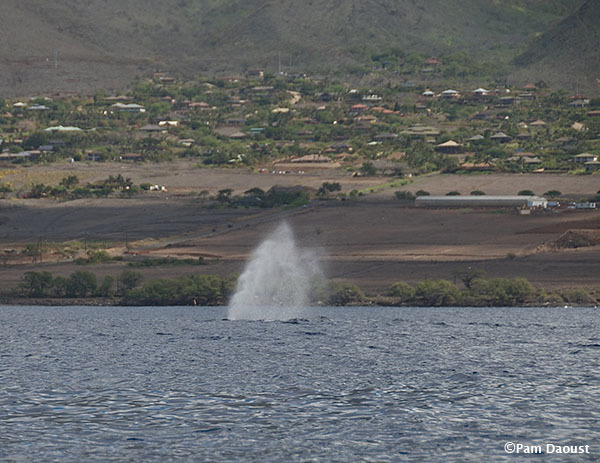 A “blow” reveals a whale’s presence at or near the surface. The whale has come up to breathe but first must expel the breath it has been holding. The rapidly expelled breath condenses to form a misty spray or spout shooting as high as twenty feet into the air. Adults can stay underwater up to 45 minutes, calves only three to five. “Pec slapping” may involve one or both pectoral fins. A single fifteen-foot-long pectoral fin can slam down hard enough to create impressive white water. The whale may be signaling other whales or simply entertaining itself. “Tail slapping,” often done repetitively or to show aggression, has a gunshot-like sound that can carry a long distance and startle folks from sleep on a still night. Juveniles seem to relish practicing this particular skill. “Spy hopping” is when a whale rises vertically out of the water and appears to take a leisurely look around, checking surface activity. “A fluke up dive” signals a whale heading for the ocean’s depths. As the whale rounds into the dive, it often lifts its tail, providing a farewell photo op. 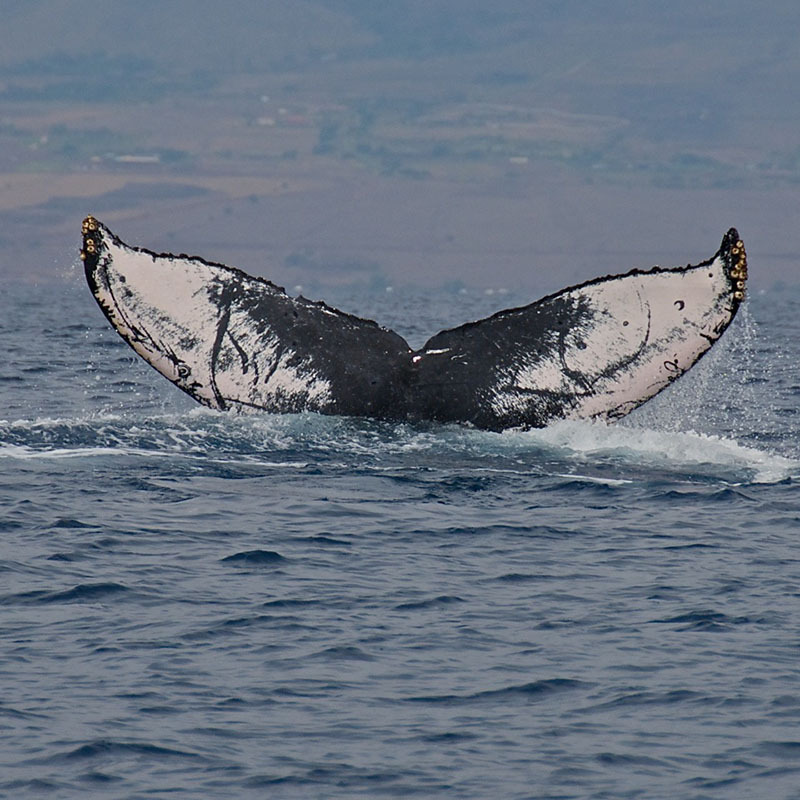 Each whale has distinctive fluke patterns that whale researchers can use to identify and track the whale. The undersides of some flukes are predominantly white, others dark. Scars or bite marks add detail. Fluke markings are like fingerprints—unique to each individual. Two notably aggressive whale behaviors are “head lunges” and “peduncle throws.” A courting male may lunge at other males to drive them away from a female, or an eager suitor may toss its tail, powered by the peduncle muscle, in an angry motion. A peduncle throw can be used to back off a competitor, or, when displayed by a female, to say no, I’m not interested in mating. If whale activities distract you while driving, please pull over somewhere safe to enjoy the show. Be wary of drivers stopping or slowing down to gawk. Extra vigilance during whale season will ensure happy memories of these iconic annual visitors. 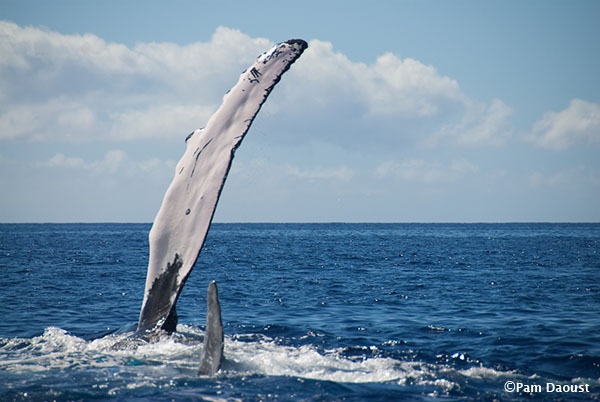 To learn more about whale behaviors, visit Maui Ocean Center’s Marine Mammal Discovery Center and the new whale-watching platform, the Ma‘alaea Lookout. Photos courtesy of Pam Daoust, Contributing Writer for Maui Ocean Center. Ka Mo’olelo Moana, or “The Ocean Story,” is a monthly column submitted by Maui Ocean Center staff members and contributing writers. Originally published in The Maui News on Sunday, February 7, 2016. All images appearing in this Ka Mo‘olelo Moana article are the exclusive property of Pam Daoust. The images may not be reproduced, copied, transmitted or manipulated without the written permission of Pam Daoust.